I have been changing up the format of this site a bit. Now that I have Cuuscomp out of the way I am playing around with Rebrick and a few other features but I have more time to dedicate to the "journalistic" side of the house. With that I have started interviewing my fellow FOLs, for instance this interview with Mike McCooney, creator of the Iron Man posable build and Jon Hall of the Spirit of Freedom. 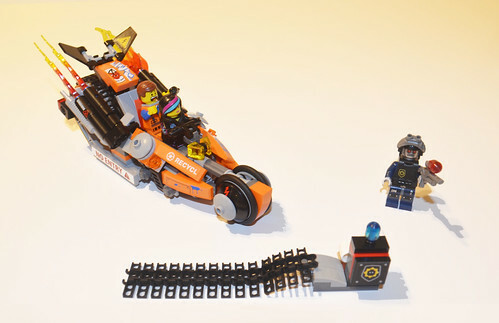 I have more interviews on the way but I have also decided to start adding review to this sites repertoire and I am going to start this of with a bang: 70808: Super Cycle Chase! So during the holiday crunch time I have only been able to get to the first bag, the second half of the build will hopefully be quick in coming but the fist bag is pretty much a complete set in itself! 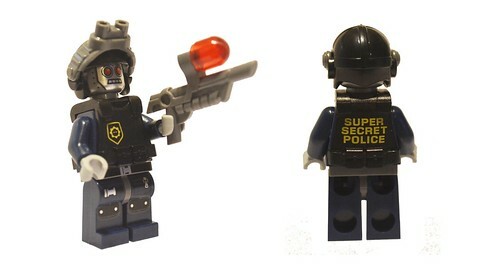 The whole set includes Two good guys (Emmet and Wyldstyle) and Three robot super secret police. The first bag for today's review contains the good guys and "Robo SWAT." 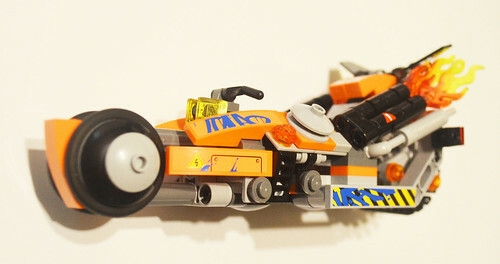 Lego really nailed it with Emmet. He has the universal appeal of the common minifig but has just enough unique features to make him stand out. The face options are a self confident smirk and extreme panic. The smirk is pretty common, not quite the Han Solo, but the panic is perfect for the rocketing Super Cycle. These faces are great choices on Lego's part as pretty much anyone can did up an old basic head for a standard smile if they feel the need but Smirks and Panic with the old dot style eyes are much more uncommon. I love how Emmet's headgear is at once classic and novel. There are deep hair lines in the piece and a tuft of hair that sticks up in the back. Emmet's name tag, which is on his leg, bears his name. I am on the fence about this. I mean, it is a nice quality, and I am sure it reflects the movie model, but the pretty muck locks these legs down and Emmet's legs, no question about it. When I first saw Emmet in the trailers I was very curious about how the red "backpack" brick worked...well, it's dead simple. It is a brand new part with a square recess. I absolutly love this figure. Where Emmet is classic nouveau, Wyldstyle is ultra modern and style and technology: prints on the arm, prints on the hair, even prints on a brand new custom hoody all with a rebellious asymmetric color splash on only one side ala Two Face. Both of her expressions carry a edge that fits the rest of the figure like a glove with slight variations of an almost Mona Lisa-esqe smile and...I am going to say, concentrating. The concentrating look goes best with the Cycle by far as it looks like she is paying attention to the road ahead of her, dodging some obstacle, not harried or rushed, just in the zone and making her move. On a personal note, I must admit a bias towards this fig as it bears a shocking resemblance to my Ballroom dance instructor...granted she did not have a pony tail but she does have the shock of color. What we have here is a solid "baddie" The red robot eyes make it clear this guy is up to no good. The rest of the body is standard fare for any security guard. The flack jacket is very nice but the printing on the back makes its usage very specific. The night vision goggles (soon to be found on Ghostbuster mocs everywhere) are the real take away from this guy and I can see the Legs getting a ton of milage. I think the "gun" looks pretty cool but I expect that where it will really make headway is as a greeble element. This has hi-tech clip-on written all over it, especially with all the connection points: top clip, handle, barrel, and "pump." 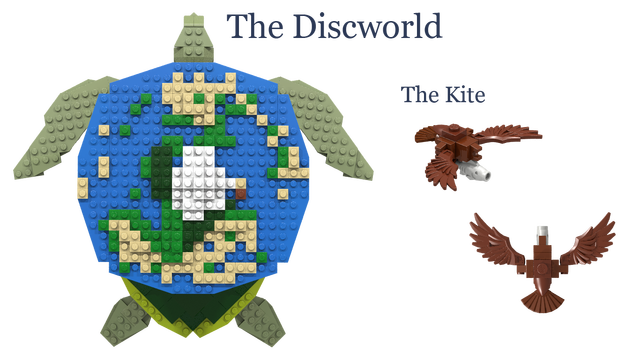 Most Lego sets are designed to model a specific subject (fictional or real) or they are designed to be compelling while working within a play-theme. The Super Cycle is an exception to this traditional design methodology. 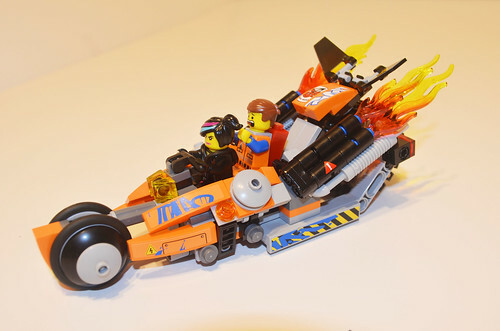 The Super Cycle was designed for the Lego Movie to showcase to a broad audience what Lego is truly capable of building, to break down preconception about what you can do with Lego (or at least that is what my instincts tell me). In that regard Luis Castaneda, the sets designer really nailed this one. The vehicle looks amazing in its own right: Very unique and eye catching, just the kind of thing you would think a character named "Wyldstyle" would be using to burn up the pavement. You can feel the speed coming off of it. In addition to the raw attractiveness though is an exceptionally well crafted piece, expertly integrating traditional brick with technic while also introducing some basic greebling and advance snotting techniques. This model is a ton of fun to build. 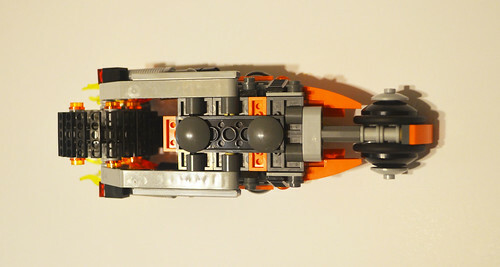 The "seat" and rocket element of the Cycle are made of more traditional Lego elements while six trusty 10247s (the professional's choice for system/technic interface) connect the technic element creating the front and back wheels. My favorite aspect of the Cycle is the four slope curved 4 x 1 No Studs on full 90 degree snots and hinged 2x2 plates. Everything fits together so snug that any serious designer should be taking notes! It is hard to tell if this is intentional or not but the back wheel is made of a set of treads enclosing a large gear, so there is just a little bit of give. One of the effects of this is a that when you roll the Cycle you get a clacking/chugging noise that if you are in the right mindset is somewhat reminiscent of a powerful motorcycle. This Super Cycle looks fast and it looks awesome and it is built with great techniques, but it really does not roll very well at all. The front wheel sometimes won't spin and the back wheel is a set of treads so there is a lot of friction. But if you want something that rolls like a racer, I recommend a Speedorz. I can actually respect this tradeoff just fine. When I buy a Lego space ship I expect it to look cool, I don't expect it to fly well. That being said, my son once got a "toy car" that did not roll at all and that pretty much broke his world view for the day so, fair warning. Now I would usually only apply swooshability to an air/spacecraft of some sort but it is worth mentioning that the Super Cycle has an awkward swoosh factor. It is hard to explain this but you will notice it as soon as you pick it up. There really just is not a good place to hold it while "swooshing" right above a surface (you know, like you would with a car). The back is just too much of a handful and if you hold it by the middle, well, you can't see the figs. The spoilers (wings clipped to those little gun type elements) tend to pop off when you adjust them but I am totally going to be stealing the technique for my next build. In posing the build for photos I encountered an interesting quality of this build. 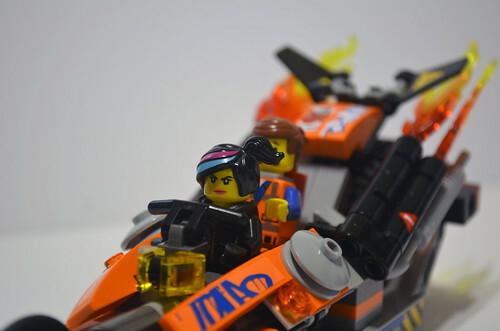 Emmet and Wyldstyle, as I alluded to earlier have these awesome expressions for the build. Wyldstyle with this look of concentration and Emmet loosing his bricks. 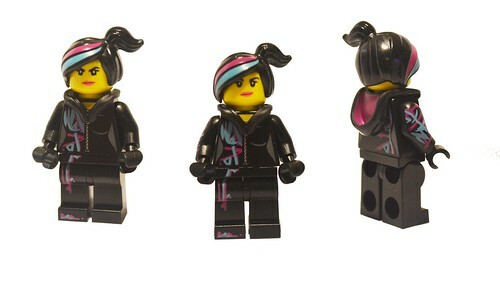 Well the figs are as close as you can get minifigs to be in the Super Cycle and Wyldstyle has this giant ponytail coming off the left side of her head. 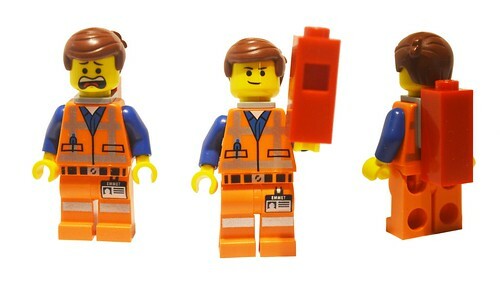 This means that a lot of poses you might come up with for the build will have Emmet's head totally blocked by Wyldstyle's hair, but only on the port (left) side. Thinking on it, I actually find this endearing rather than problematic. The last feature of bag one of the playset is this nifty road block. 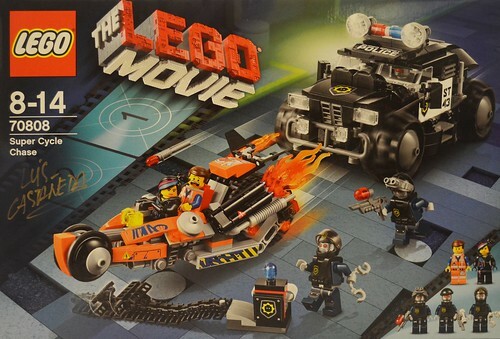 It is very similar to the concept used in set 60007 High Speed Chase. The difference with this version though is that it comes with a nice little gimmick where you roll up the treads and then flip a technic arm to unfurl it. It is a fun addition to the build but it can be surprisingly difficult to get the hang of it. The figures are awesome as is, some of my favorites but opportunities for kitbashing are pretty limited . The cycle is a blast to build, looks great, and can teach a lot to both novices and advanced builders but if you are looking for something that rolls like a race car then you will be disappointed. I will add a link to the second half of this article when I review the Super Secret Police Vehicle. 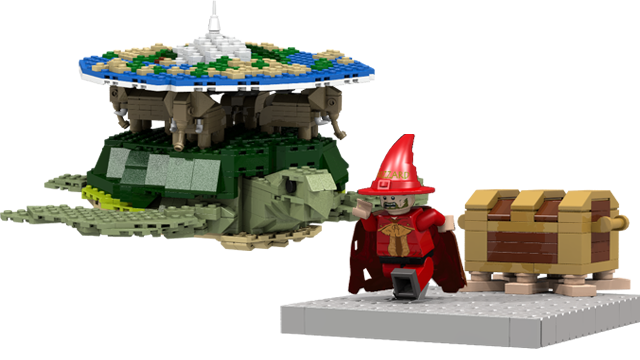 Builder Interview: Mike McCooey a.k.a "mmccooey "